Amatrol’s Electric Motor Control Learning System (85-MT5) covers electric relay control of AC electric motors found in industrial, commercial, and residential applications. Learners study industry-relevant skills including how to operate, install, design, and troubleshoot AC electric motor control circuits for various applications. The 85-MT5 includes a bench top-mount control workstation, motor workstation, AC induction motor, control component panels, multimeter, lead set, and student curriculum that is unmatched within the industry. This system uses industrial quality components to train learners to become better prepared for what they will encounter on the job. Some of the major components that learners will work with include a control transformer, reversing contactors, manual motor starter, multi-function timer, and control relays. The 85-MT5 teaches learners how to troubleshoot motor control circuits under realistic conditions. Circuit faults can be introduced using either the manual fault insertion, supplied as a standard, or through the optional Computer-Based Fault Insertion System (890-FTS-1) which includes Amatrol’s FaultPro, the industry’s only electronic-fault insertion software. The 85-MT5’s electric motor and control components are off -the-shelf industrial standard components that provide learners with real world experience in installation and control of industrial motors. The motor is rated at 1/3 Hp and uses industrial standard T-number wiring terminology. Units are connected to load devices through an industrial standard flexible coupling that provides for learning of shaft alignment techniques. Safety is emphasized throughout the curriculum and in the hardware design. Safety devices include a lockout/tagout system and grounded connections for individual components in the system. Learners use these safety devices each time they set up a circuit. The 85-MT5 Motor Control System Workstation’s welded-steel construction provides a sturdy work surface for mounting control components. Each component is mounted directly onto an individual heavy-duty steel panel, which easily slides into the workstation and locks into place, allowing learners to quickly set up a variety of circuit applications. 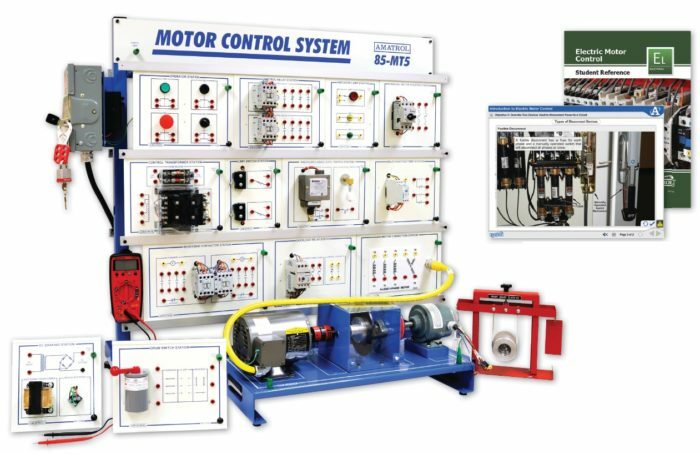 The 85-MT5’s industrial electric and AC motor training curriculum is unmatched within the industry for its breadth and depth of motor control topics and hands-on skills. This curriculum advances through topics like three-wire start/stop control, reversing magnetic motor starter, and on-delay and off-delay timers that can then be used to practice hands-on skills. As an example, learners will study about the function, operation, and types of control relays and then practice hands-on skills by actually connecting and operating a control relay in a circuit. The 85-MT5’s curriculum is presented in an interactive multimedia format that combines text, audio, 3D illustrations, and loads of interaction to fully engage learners as they begin at the foundation of motor control knowledge. It also includes access to Amatrol’s Virtual Trainer Courseware (N17401). The 85-MT5 features a variety of manual faults that allows learners to practice real world troubleshooting on actual industrial components. Troubleshooting skills include testing an indicator lamp, manual switch, control relay, motor contactor, overload relay, and many more! Optionally, the 85-MT5 offers electronically inserted faults using the 890-FTS-1 Computer-Based Fault Insertion System. The 890-FTS-1 uses Amatrol’s electronic fault insertion software, FaultPro, which allows learners to practice troubleshooting over 35 faults on this learning system.